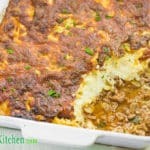 A delicious all-in-one Low Carb Shepherd’s Pie, inspired by the cooler weather. This comforting dish is loaded with lamb, vegetables and cheese - is there anything better! Add the oil, onion, garlic, thyme and salt and saute until the onion is beginning to turn translucent. Break up the ground lamb and add to the saucepan. Brown the mince while breaking it into smaller pieces with a wooden spoon. When the mince is browned, add the diced tomatoes and stock. Simmer for 20 minutes. Add the mushrooms and simmer for another 15 minutes. Add the zucchini and simmer for 5 minutes before turning off the heat. Pour the mixture into your casserole dish and set aside to cool slightly. Boil a saucepan ⅔ filled with water. Add the cauliflower and cook for 10 minutes, or until the cauliflower is tender. Drain the cauliflower well then return to the saucepan. Add the butter. Blend the cauliflower into a puree using a stick blender. Add the cheese and blend until melted and mixed through. Add the egg yolks, salt and pepper and blend well. Spoon the mash on the top of the Lamb Pie mixture and spread evenly. Top the Cauliflower mash with cheddar cheese. Bake in the oven for 20-25 minutes, until the cheese is browned. Remove from the oven, serve and enjoy.